President Barack Obama speaks about his Supreme Court nominee Merrick Garland, at the University of Chicago Law School in Chicago, April 7, 2016. Obama also spoke with Fox News anchor Chris Wallace at the school. U.S. President Barack Obama said the worst mistake of his presidency was failing to prepare for the aftermath in Libya after the NATO-led intervention toppled Libya leader Moammar Gadhafi in 2011, leaving the country in chaos. Obama reflected on the highs and lows of his two terms in the White House in an interview with Fox News. He told Fox News' Chris Wallace that his biggest mistake was "probably failing to plan for the day after," but he added that intervening in Libya to protect civilians from the Gadhafi regime was "the right thing to do." After the Libyan strongman was killed, months after the United States and European nations launched aerial attacks, the Middle Eastern country was left in chaos that continues to this day. 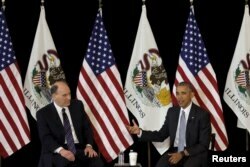 U.S. President Barack Obama, right, speaks with University of Chicago law professor David Strauss in Chicago, Ill., April 7, 2016. Obama taught constitutional law at the school for over a decade. Militias took over with two rival parliaments and governments forming and Libya became a major departure point for migrants trying to reach Europe, helping fuel the continent's immigration crisis. A United Nations-backed unity government has arrived in the capital Tripoli, but neither of the rival parliaments has so far formally backed the U.N.-brokered accord. Obama said he views Libya today as a "mess," and told Atlantic magazine in another interview that British Prime Minister David Cameron became "distracted by a range of other things" after the Libyan operation. Obama also criticized former French President Nicolas Sarkozy for mishandling Libya after Gadhafi's ouster. When asked about the president's remarks during Monday's White House briefing, Press Secretary Josh Earnest quoted Obama's September 2015 speech to the U.N. General Assembly that "our coalition could have and should have done more to fill a vacuum left behind." The White House spokesman said the president has tried to apply the lesson learned in Libya in considering the use of the military in other circumstances. "Asking the question about what situation will prevail and what sort of commitments from the international community will be required after that military intervention has been ordered by the commander in chief,'' Earnest told reporters. The press secretary said the president was not trying to make the point that "any specific ally of the United States had utterly failed to follow through on a specific commitment that they had made, but rather that the United States and our broader coalition had not succeeded in mobilizing the necessary resources to bring about the scenario that we would have eventually liked to see." U.S. President Barack Obama pauses while speaking about his Supreme Court nominee to students at the University of Chicago Law School, where Obama taught constitutional law for over a decade, in Chicago, April 7, 2016. Obama said his biggest accomplishment during his seven-plus years in office was "saving the economy from a great depression," the 2008 and 2009 economic plunge that was the worst in the country since the 1930s. Millions of workers were laid off, with many of them losing their homes because they no longer had the money to make mortgage payments to banks, but the U.S. economy remains as the world's largest and the jobless rate has returned to its historical norms. Obama, who leaves office next January, said the best day of his presidency was the 2010 congressional passage of national health care reforms that came to be called Obamacare, changes that have handed health insurance to millions of people who were uninsured or have made it affordable for them to buy policies. Most Republican opponents of the Democratic president still denounce Obamacare as an overreach of the national government. They have failed dozens of times in trying to repeal it and have been unable to agree on a plan to replace it. Obama said the worst day of his presidency was visiting the small Connecticut town of Newtown, two days after the mass shooting at an elementary school there in late 2012, when a gunman killed 20 students and six educators.